Why is PPE considered the last resort? 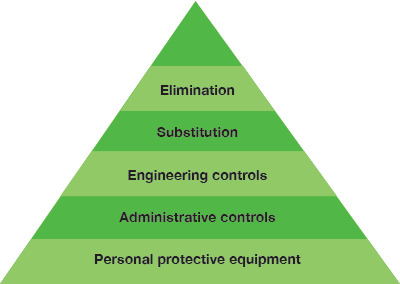 Starting at the top of the pyramid here and working downwards, attempts to eliminate or control the hazard should be attempted before going straight away to using personal protective equipment. The most effective strategies are at the top trending down to what is considered the “least effective”. 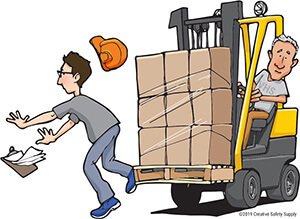 As an example, we will take the hazard of people being struck by forklifts in the workplace. An employer should look first how necessary are the forklifts? Are heavy items being moved so often that forklifts are necessary? If the answer is yes, the employer should move onto substitution. Can a non-motorized vehicle be used to transport items? If forklifts are still deemed necessary, it is time to implement engineering and administrative controls. Engineering controls include steps to change the workplace. This could be adding floor tape to designate separate lanes for pedestrian and forklift traffic. Administrative controls focus on training measures and could include implementing extra training or signs indicating pedestrian heavy areas. Finally, hi-vis safety vests should be worn to make pedestrians stand out to forklift rivers to avoid hitting them. Although PPE is considered the last line of defense, it is still extremely important for workplaces to have it readily available. Comprehensive training and additional PPE should also be provided to ensure workers are safe under any conditions, and if any controls put in place fail. PPE may be labeled as the last line of defense, but it is as equally if not more important as the other lines of defense in the hierarchy. If the other steps fail, the worker can be put at risk for serious injury or death. How does a job hazard analysis work for PPE?